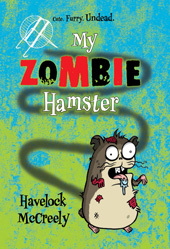 A laugh-out-loud funny middle-grade debut with a scary twist, My Zombie Hamster will appeal to readers who like their animal stories mixed with chills. Fans of R.L. Stine’s Goosebumps Most Wanted series will grab this one right up. Matt Hunter and his buddies are looking forward to Christmas–actually, they’re looking forward to receiving the latest sword-and-fantasy video game. But Matt’s parents have other thoughts–they give him a fluffy little mammal, a hamster called Snuffles, for the holiday. And his grandmother makes it worse by giving him a hamster cage and wheel. But the hamster isn’t all that cute–at least not after part of its cheek and belly fall right off–without bothering it a bit! And why is it staring at Matt with black beady eyes and a lean and hungry look? Say hello to Anti-Snuffles, the zombie hamster! Or better yet, run! This series combines middle-school readers’ passions: humor, animals, and scary stories, into one unbeatable package. One Copy of My Zombie Hamster. US and Canada only. Void where prohibited by law.